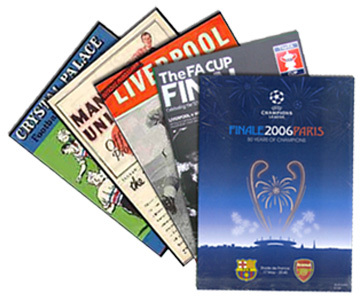 We are one of the world's largest dealers of football programmes and football memorabilia with a stock of over 750,000 football programmes covering the last hundred years. We have the most powerful and most advanced programme search engine available on any football memorabilia website! Whether you are searching to fill the exclusive gaps in your programme collection or looking for a unique and interesting present, we can help. Our huge stock covers every English and Scottish League club, many European clubs, World clubs and International teams as well as non-league teams, youth teams and reserves! We have a very large selection of big match programmes from all the major competitions including the Premier League, Championship, FA Cup, League Cup, UEFA Cup, European Cup, Champions League, European Championship, World Cup, International Friendlies and much more. Pre-Order your Cup Final programmes! If you are interested please email allyslaptop@btconnect.com for a copy now. Please note that you can now pay using your PayPal account. PLEASE DO NOT use this method until you have checked by email that the items are available and what the total cost is (inc. carriage). Please subscribe to our FREE newsletter so you can be the first to know when we have updated the website with new arrivals.